I don't know about your kitchen but we have fruit flies all over ours. I opened the toaster oven the other morning and was greeted by a small cloud of busy fruit flies. What they were after in the toaster oven is beyond me! 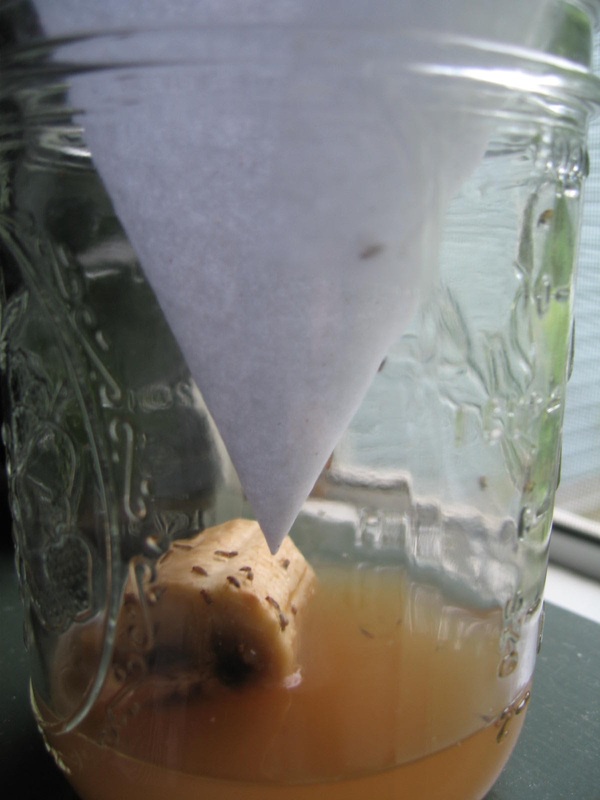 But here's a really efficient fruit fly trap that's really catching a lot of those little buggers. I can't take credit for this idea but I can't remember where I saw it. I've tried using vinegar with a drop of dish soap in it to break the surface tension and it worked alright but I always felt like there were a lot of flies lurking around the outside that never really made the commitment to light on the vinegar to take a sip. Simply add about 1/2" of vinegar to a jar. Add a drop of dish soap. Add a piece of fresh fruit. 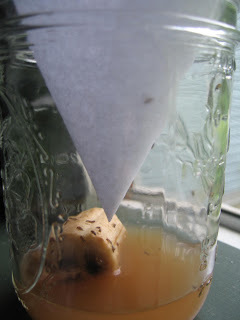 Make a paper cone with a fruit fly sized hole in the bottom. The cone must fit the top of the jar snugly so the flies can't crawl out. I taped mine to the top of the jar in two placed to avoid any warping from the high humidity. So they crawl in the hole at the bottom of the cone to get to the fruity vinegar and can't find their way out! Just look at all the flies inside!